Since 1862, the naturalization laws have provided special benefits for noncitizens who performed specified service in the U.S. armed forces. No residence within the state or INS district where the application if filed is required, and the application can be filed in any Service district, regardless of the applicant’s place of residence. The generally prescribed requirements of five years residence and prescribed physical presence in the United States, and three months residence in the state or Service district, do not apply. 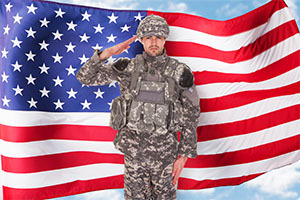 The preclusion of naturalization because of an outstanding removal proceeding or order does not apply to an applicant who is then actually in the armed forces of the United States. World War I, defined by regulation. as beginning April 6, 1917 and ending November 11, 1918. World War II, for this purpose specified in the statute as beginning September 1, 1939 and ending December 31, 1946. The Korean hostilities, for this purpose specified in the statute as beginning June 25, 1950 and ending July 1, 1955. The Vietnam hostilities, specified in the statute as beginning February 28, 1961 and ending on a termination date to be fixed by Executive Order. An Executive Order terminated the Vietnam hostilities for this purpose on October 15, 1978. During any subsequent period of hostilities designated as such by Executive Order. A July 3, 2002 Executive Order authorized expedited naturalization for noncitizens who served in an active-duty status in the “war against terrorists of global reach.” The order designated September 11, 2001 as the start date for this designated armed conflict. A terminating date will be set by a future Executive Order. On October 1, 1991, the President signed the Armed Forces Immigration Adjustment Act granting special immigrant status to noncitizens who have served honorably or are enlisted to serve in the military for at least 12 years. The Act benefits primarily about 3,000 Filipino sailors in the U.S. Navy. A 1990 statute authorized the posthumous grant of U.S. citizenship to an alien or noncitizen national who dies as a result of injury or disease incurred in or aggravated by active-duty service in the U.S. armed forces during certain specified armed conflicts. Another 1990 enactment provides for the grant of naturalization benefits to Filipinos who served in the Philippine Army or in other Philippine forces under command of the U.S. armed forces during World War II. Such military service must have been honorable, and if the applicant was separated from the service, he or she must have been separated under honorable conditions. The law specifies that the executive department under which the service was performed determines and certifies whether it was honorable and in active-duty status and whether separation from such service was under honorable conditions. Unlike the statute discussed above, the statutory provisions dealt with here do not explicitly state that such executive determinations and certifications are conclusive, but it is clear that this was intended and that the executive certification is the exclusive method of proving the nature of the service. He or she may be naturalized regardless of age. The preclusion of naturalization because of an outstanding deportation proceeding or order does not apply. The special restrictions relating to alien enemies do not apply. The generally prescribed requirements of five years residence and requisite physical presence in the United States, and three months residence in a state do not apply. No residence in the jurisdiction of the USCIS district is required, and the petition can be filed in any Service district, regardless of petitioner’s place of residence. However, under the prior naturalization petition procedure, the applicant must have been physically present in the office of the clerk of court, unless excused by illness or disability. Persons filing naturalization petitions under this subsection for service at any time after February 27, 1961 and before official termination of the Vietnam hostilities were exempt from federal naturalization fees. The regulations require good moral character as well as an attachment to the principles of the Constitution and a favorable disposition for one year before the naturalization application. The person must have served honorably. The request is accompanied by a duly authenticated certificate from the executive department under which the person served, which states that the person satisfied the eligibility requirements set forth in INA § 329A(b). The Attorney General is satisfied that the requirements concerning honorable service have been met. When such a request for posthumous citizenship is approved, the Attorney General shall send to the individual filing the request a document stating that the U.S. considers the person to have been a citizen of the U.S. at the time of the person’s death. It is important to note that this posthumous citizenship is essentially an honorary grant. The 1989 Act grants no immigration benefits to any spouse, son, daughter, or other relative of a person granted posthumous citizenship under this section.